Marko Ristić (1902 - 1984) Marko Ristić jedan je od glavnih protagonista srpske nadrealističke scene. Antiroman Bez mere je objavio 1928. godine. Bio je urednik almanaha Nemoguće 1930. godine. Također je uređivao i časopis Nadrealizam danas i ovde. S Vanom Borom 1932. Objavljuje čuveni Anti-zid. Poemu Turpitude je pokušao objaviti uz 1938. no zaplijenjena je odmah po izlasku iz tiska. Turpitud je popraćena ilustracijama Krste Hegedušića. Bio je ratni zarobljenik u 2. svjetskom ratu a poslije jugoslavenski ambasador u Parizu i član JAZU. Marko Ristic is one of the main protagonists of the Serbian surrealist scene. During his stay in Paris in 1926 -1927 he had the opportunity to meet André Breton and the Surrealist Circle. After his return from Paris in 1928, Ristic has published anti-novel Without the Measure, Ristic was also one of the editors of the magazine "Surrealism Here and Now" in 1931. and 1932, which have marked the end of the Serbian Surrealists. He has continued his artistic and publishing activities with The Book in collaboration with Vane Bor, by Anti-wall Editions in 1932, presenting lyrics and poems. Ristic poem Turpitude was confiscated and banned in 1938 "because in its entirety it is a crime punishable under the Law of the Protection of Public Security and Order in the Country" as stated by the State Prosecution received by Ristic on July, 17, 1938. This Paranoid - Didactic Rhapsody, as indicated in the subtitle, is a surrealistic poem in which author in accordance with the principles of the surrealist aesthetics has associated eroticism, war and daydreaming. It is illustrated with drawings by Krsto Hegedušić. During the process entire edition of Turpitude was destroyed, but police officials kept a couple items that were later available at flea market, while single copy has remained with Ristic. Magazine Delo has published Turpitude for the first time in 1955. During the World War II Ristic has spent some time in captivity, and since 1944 his political texts were published in magazines "Politika / Politics" and "Borba / Fight". 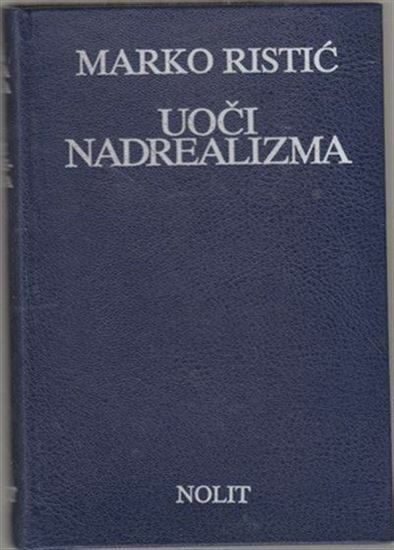 Ristic is one of the founders of the magazines "Svedočanstva / Testimonials" (1952.) and "Delo / Work" (1955). In 1951 he was appointed Yugoslav ambassador in Paris and corresponding member of the Yugoslav Academy of Sciences and Arts in Zagreb.